The Video and Audio Sources pane allows you to view and select the sources for the main video, Picture-in-Picture (PiP) video, and audio. You can also adjust the audio level and preview the selected video sources. Video and Audio Sources are affected by the hardware connected to the computer when Recorder opens. Always verify the selected sources prior to recording start. You can record from the screen, camera, screen and camera, or two cameras. You can flip your camera video, both vertically and horizontally, so you can set up your camera out of the way of the participant. To flip camera video, click Modify camera settings . If the audio is going into the red in the Audio monitor, move the audio slider to the left. Click Test Recording in the Recorder toolbar to create a 15-second video test recording to verify the video and audio. Need to save disk space? You can change the size and frame rate of the recording. Click Modify screen video settings or Modify camera settings to adjust the video settings. If your video is too dark or you want to zoom in, some cameras allow you to adjust these settings. To change the camera properties and preview the results, click Modify camera settings and then click Camera Properties. Use the dropdown lists to select from the various video sources. You can choose both a Main Video and a PiP Video, or just a Main Video source. The following show example configurations as seen in the Preview Window. If you record both main and PiP videos, after you import the recording into Manager, you can produce highlight videos with or without the PiP included. You can also adjust the location of the PiP. Select a video source and click Modify screen video/camera settings to adjust the video settings. Screen (Primary Monitor): Record the desktop of the monitor set as the primary monitor. You can set the primary monitor in Start > Control > Display > Settings tab. Screen (Entire Desktop): Record the desktop of all monitors connected to the computer. The more monitors you record, the larger the recording file size. Screen (Region): Select and record a portion of the desktop. If you have multiple monitors, but only want to record from one that is not the primary monitor, use Screen (Region) to select the desktop of only one monitor. Camera: Select from the connected cameras. 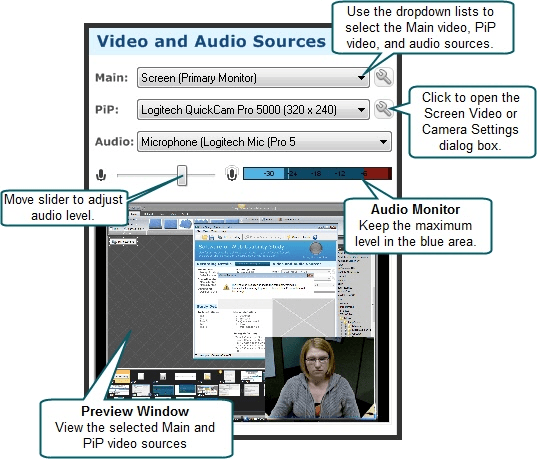 To set up a configuration without the session cameras connected, select Camera (Not plugged in) to set a camera as the main video. Save the configuration and reopen it once a camera is attached. The camera is automatically selected as the main video source. Select a video source and click Modify camera settings to adjust the video settings. None: Do not record a PiP video. 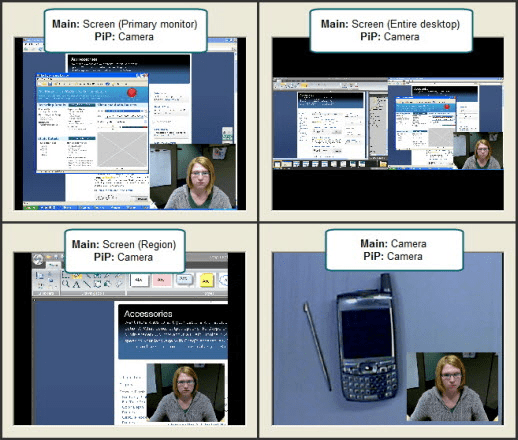 To set up a configuration without the session cameras connected, select Camera (Not plugged in) to include a PiP video. Save the configuration and reopen it once a camera is attached. The camera is automatically selected as the PiP video source. Use the dropdown list to select from the various audio sources or choose not to record audio. You can also use the Audio Monitor to view and adjust the audio level. None: Do not record audio. Audio Devices: Select from the available audio devices, including stand-alone microphones, computer sound cards, and camera microphones. Use the Audio Monitor to view and adjust the audio level. Use the following to help you adjust the audio level. Before each recording, create a test recording to verify audio levels.